If you are on this page right now, reading this article…chances are that you already know the endless benefits of Reading with your kids. Studies show that early reading with your kids helps them learn to speak, interact, bond with you and read early themselves. The more reading kids do, the more quickly they will develop as readers. It is often recommended that parents spend at least 15 or 20 minutes reading with their kids each day. 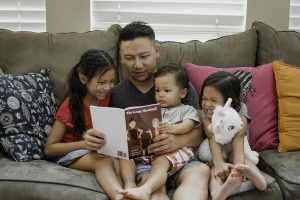 Reading with Your Kids magically strengthens the natural bond you two share and will enable both of you to connect with what is important to your lives. Did you know? If you read together for 20 minutes a day, 7 days a week, you get more than 121 hours of bonding time with your kids every year. It not only allows parent and child to develop life long bonds but also helps your child feel close to you, and the feelings of love and attention encourage positive growth and development. Through reading children learn about people, places, and events outside of their own experience. Kids experience these new situations through books before they encounter them in real life. Reading exposes kids to increased vocabulary and advanced speech patterns, It also helps kids to absorb information on how to form sentences and how to use words and effectively in their writing and speaking helping them develop better communication skills. Story time helps reward kids for focusing. Kids have to sit still and quietly so that they can focus on the story when they are reading helping them develop develop longer attention spans. By cuddling together with a book your child learns that Reading is FUN and that they are the most important thing in your life. So there you have it, benefits of READING is endless! Celebrate the LOVE of reading everyday by tuning in to the ReadingWithYourKids podcast and be sure to check out our daily dose of author interviews, book reviews, exciting author services and more. Now, go grab a good book and start reading with your kids!